A drama-filled day at Cowboys training camp ended with a nightcap: running back Ezekiel Elliott standing in solidarity with quarterback Dak Prescott and team owner Jerry Jones over the national anthem. 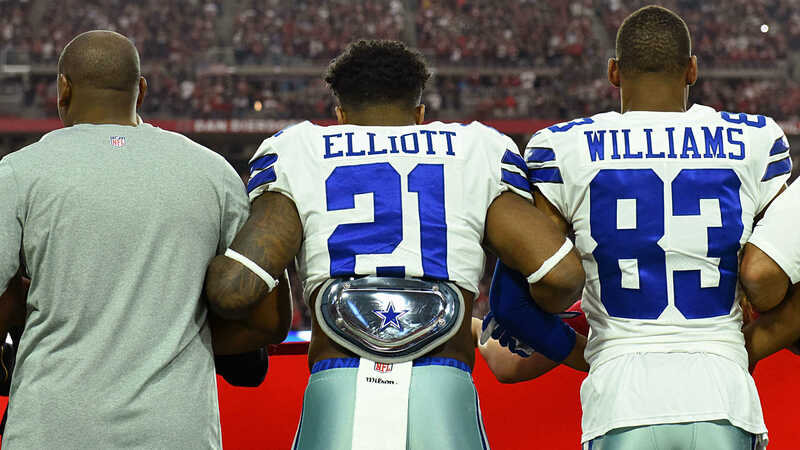 Elliott on Friday told reporters, including Clarence E. Hill Jr. of the (Fort Worth) Star-Telegran, that he, like Prescott, is on board with Jones’ insistence that players stand for the anthem rather than kneel or sit. Prescott told reporters Friday morning that the playing of the anthem prior to NFL games isn’t “the time or the venue” to make a statement against police brutality and social injustice. “It takes away from the joy and the love that football brings a lot of people,” Prescott told reporters, per the Star-Telegram. Jones this week repeated his demand that players stand for the anthem, “toe on the line.” His statement drew praise Friday from President Donald Trump, who previously said players should be suspended without pay for protesting during the anthem. In May, NFL owners, partly in response to pressure from Trump, approved a policy that would allow players to remain in the locker room during the anthem but require them to stand if they took the field. The players association announced in early July that it had filed a grievance in response. The league and the players announced jointly on July 19 that the policy was on hold. The statement came out after it was reported Dolphins owner Stephen Ross would force players to stand. Ross later tried to clarify his stance to say no decision had been reached. The league and the players association met Friday to discuss a resolution to the anthem issue. A brief joint statement did not indicate whether the sides made progress.